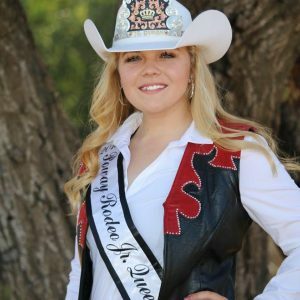 Rodeo Queen’s are the ambassadors for the sport of rodeo. They are the spokeswomen for the sport and the community. Knowledge of the sport, poise and horsemanship are all essential skills for this important job. 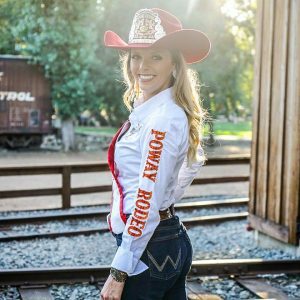 Each year the Poway Rodeo holds their Rodeo Queen Pageant to choose their ambassador. The Pageant is made up of three categories: Personal Interview, Horsemanship and Public Speaking. Each contestant will be tested on their knowledge for equine, rodeo facts and current events during a private personal interview. During the horsemanship competition, each contestant will display their riding ability while performing a designated pattern and presentation run for the judges. Additionally, they will be quizzed on their knowledge of horse science, tack and terminology. During the final public speaking competition, the contestants will display their speaking skills, model, and answer impromptu questions on stage. During the entire competition each contestant will be judged on personality, goals and poise in hopes of choosing the most qualified ambassador for our sport. Weekly meetings are required to help prepare the girls for the pageant. These will be held on Thursdays at Midland Elementary School at 6:30 pm. Our next Queen's Contestant will take place March 16th 2019. Check our Facebook page for updated information. Performance dates for the 2019 Poway Rodeo are September 27th and 28th. Visiting Royalty may contact the Queens through the "Contact Us "